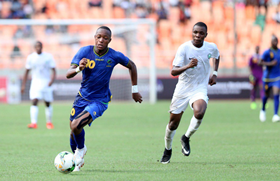 Speaking at the post-match press conference, Tanzania coach Oscar Milambo has blamed his team's loss on the inconsistency of his inexperienced players. When you have a lead, of course I believe you'll concentrate even more but we were not in that same particular attitude and that's why we had to concede two more goals and at the end of the day we lost the game. What's the name of the game? The name of the game is fair play, right. The boy was down and injured, you cannot ask for more. If at all he's injured, it means that we should first concentrate and see the safety of our boys rather than thinking on how we are going to win the game. But it is unfortunate that was not the case, it's not that the team was tired or they did not have energy. The energy was there, what we told them it was a time they have to manage the game and of course wait for the right moment to attack. We are playing the winner of the World Cup. The other day I said here there's no experience in this category for the players. The only experience remains to the FA and the technical staff. Now we are playing against a team that have experience and that being the case, they know what to do more than we trying to establish ourselves. So that's the only thing I can say and for the Nigerians.